So you have made it through the application and phone screening phases and landed an interview? Congrats! Now you can meet face to face and secure the position. Feeling anxious yet? It can be a bit unnerving to prepare for your interview. After all, it is pretty important to your career. Don’t worry though, most people get pretty nervous beforehand, but there are a few steps you can take to make your interview successful. We’ve received so many questions about the topic in our public speaking and leadership training courses that we developed this post to explain more in detail. Take a look at these five steps to help you show your best professional self and ace that job interview! Companies will want you to be familiar with their company & its industry. You can impress them by providing details on the current marketplace and where they fit in it. Do your homework on the company and marketplace. Not only will this help you answer questions from the interviewer, it will help you determine if the company is a good fit for you. Interviews aren’t just a method for employers to find the best talent for their role, it is also an opportunity for candidates to determine if this is the right organization for them. Check out sites like Glassdoor & Salary.com to review information like salary estimates and reviews from current and former employees. Review the company’s website to read their values and beliefs to get a feel for their company culture. Scan Google & other social media sites for recent news stories on the company to see why they are making headlines. You can also use this information to ask questions at the end that show you did your research. First impressions are unavoidable, particularly in an interview setting. A recent scientific study from New York University revealed that in less than a blink of an eye people make unconscious assessments of others. Hiring managers are often just as quick to judge our skills, capacities and personality. While most interviewers will be a bit more lenient, the truth is most managers/leaders hold to those first impressions whether it is conscious or not. If you are inappropriately dressed in your interview the interviewer will form an impression that you aren’t an appropriate fit for the role. Generally, it’s better to be more formal than the job requires. Remember if you dress the part, you’ll feel more confident. Body language is the non-verbal side of human communication which we deliver along side the spoken word. 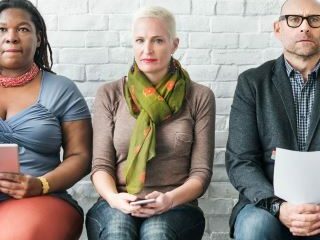 Body language comprises upward of 60% of our total human communication and the interviewer will certainly be watching how you connect with them on a non-verbal level. Remember to exude confidence through your body language. Make sure your posture is good, with no slouching or slumped shoulder. A firm, friendly handshake conveys confidence and never should be overbearing or domineering. While you are talking, make sure to smile and connect with your interviewer. Make eye contact and have a positive resting face to show you are confident and engaged. Relax and let your interviewer see that you are open to the conversation. Treat the interview like a conversation where you are explaining what you do now and what you have done in the past. Practice active listening and show the interviewer that you are a skilled communicator. Remember that these soft skills are as important as any other skill or capacity you bring to the job role. One of the key things for interviewers to assess from the interview are your communication skills. Avoid mumbling and make sure to enunciate your words so that the interviewer can clearly understand the answers you are providing. Also be sure to avoid using poor vocal habits like filler words or vocal fry. Speak in a normal conversational but professional tone and avoid using slang. This will help the interviewer understand what you are saying and will make them unable to make negative judgments based on how you speak. It’s normal to get nervous before or even during an interview. There is no doubt you are being judged, it’s kind of the point! Don’t sweat it, accept your feelings, understand them and take a positive action that is alignment with your goal of attaining the role. Before the interview, simply prepare with deep breathing, positive visualization and relaxation techniques that science shows improve your interview outcomes. These techniques help leaders and public speakers deal with these very same types of stressors and difficult situations. Remember, you can only be your best professional self and being in that positive state will help it shine through. While you can’t control the outcome, you can control how you react to your situation. The bottom line: Keep yourself in a positive state of mind and do your best. If this job is the one meant for you, an offer will come. If not, you will get another opportunity. Thinking this way will also help you relax and help you have a good interview experience. So if you’d like to ace your next job interview don’t forget these skills. They will serve you well and help you show the best of who you are. Dressing the part, show through body language, your voice and your positive mindset that you are the right one for the position. When you exhibit these skills employers will see your enthusiasm, your communication skills and emotional intelligence. These ‘soft skills’ will often be the largest determining factor in your success in any role. Be the best of who you are let it shine by practicing these job interview skills. If you do, I’m confident of the fact you’ll be receiving an offer letter in short order. Got questions or comments? Please leave them below, we love to hear from you. If you found this post helpful please do join our monthly newsletter with expert tips on public speaking and leadership. 3 Responses to "5 Steps to Acing Your Job Interview"
Dressing matters a lot when acing for a job interview.Why? because the way you dress is the way you will be addressed. E.g if you are inappropriately dressed in your interview, the interviewer will form an impression that you aren’t an appropriate fit for the role. So dress properly and win that interview.. Thank you for writing about this! I have been struggling the last few months with finding work and I think it is down to my interviews tanking. I feel like I have everything going for me other than my presentation. I tend to feel like I am going to fail before I even go in for the interview. That last bit really helped me a lot and I will work on relaxation techniques for sure. This is fantastic advice that any job seeker should consider. If you are trying to work for a company, you have to prove you can be what they need and it starts with an interview. My sister is actually going on interviews next week for a few different jobs. I am going to send this article to her, I think it can help her out a lot.